This handy app lets you hold the whole city in your hands. 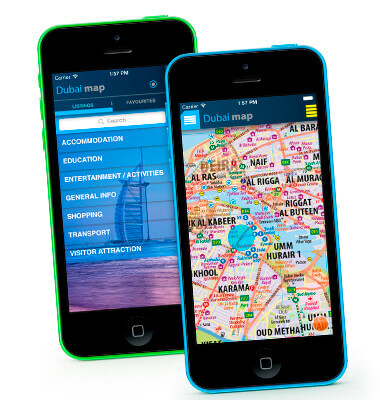 Our Dubai Map App is a must-have IOS Application for i-Phone and i-Pad users across the city. Created in-house by our software experts and experienced cartographers, the offline city app won't soak up your charge but will leave you free to roam the city. Brilliantly designed, it combines the best features of our printed maps with the latest mapping solutions. For instance, users can view their current location, direct call establishments and lock in all their favourite points of interest across Dubai. With over 20 years of mapping the emirate, our user-friendly map app covers top attractions, hospitals, hotels, highways, heritage areas, new developments, beaches and much, much more. Ideal for busy tourists, residents and business travellers, downloading our map app onto your phone has never been as easy and as useful. Download yours today and discover every inch of Dubai at the touch of a button.